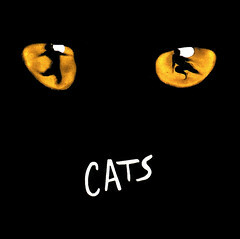 Cats is undeniably one of the all-time great 20th century musicals. Having run for a record breaking 21 years in London’s West End, Andrew Lloyd Webber’s translation of T.S. Eliot’s Old Possum’s Book of Practical Cats book to stage theatre is a must-see show for any musical theatre nut worth their playbills. So I was very excited when I heard last June that Cats was coming to Sydney and promptly booked some tickets for a girls’ night out. The stage of "Cats" at Star City's Lyric Theatre is a gorgeous, fantastical larger-than-life junkyard. The full moon, with wisps of cloud drifting across its face, looks down over a painted stage mural featuring a large tiger which is surrounded by a broken down car, dustbins, sewer pipes, an electric oven and other bits and pieces of people's discarded lives. My personal philosophy is a truly great musical should be able to stand on its own. The audience should be able to understand the characters and the story with just the music, lyrics, book, stage design, costumes and performers; without the need of any accompanying souvenir programs or other explanatory aids. I was also determined to have no expectations, since my aunt had warned me strongly of how she had been quite disappointed when she watched it many years ago, due to the show not quite living up to all the hype she had heard about it. As a result, I went into Cats knowing virtually nothing about the show, except that it was an Andrew Lloyd Webber musical about cats and it’s where the theatre standard Memory comes from. Through the years I’ve briefly heard bits and pieces, like the term “Jellicle” and the Jellicle theme, but nothing in detail. For those who have no idea what I’m talking about, here’s a quick reminder. I’ll bet you most people in the world will recognise this song instantaneously. The Andrew Lloyd Webber musicals I’m acquainted with to date are works like: The Phantom of the Opera ; Jesus Christ Superstar ; select songs from Sunset Boulevarde , Tell Me on a Sunday , Evita , and Joseph and the Amazing Technicolor Dreamcoat . Musicals which are all very much through-composed with beautiful melodies, brilliant counterpoint and sweeping, dramatic scores. Musicals with unforgettable songs like Memory (think the title song from The Phantom Of The Opera , Any Dream Will Do , or Don’t Cry for Me Argentina ). Even the rock musical Jesus Christ Superstar was quite true to strict harmony. As a result, I was quite surprised by the stylistic range of Cats . Cats is very different from the other Lloyd Webber musicals I’ve seen to date. Being based on a T.S. Eliot collection of poems for children, it has a Seussical feel to it, full of wild imagination, and doesn’t really have a plot-focused story line. In fact, the story is almost a backdrop for character exploration, kind of like how A Chorus Line is about exploring the dancers rather than the show. Going into the musical and not knowing this bit of information made it really hard for me to understand what was going in the first half as character after character was introduced and I kept wondering when the plot would start moving forward. Once I did figure it out, I was able to strop stressing and actually relaxed and enjoyed it. Cats is a really fun musical, full of humor and whimsy. My favourite numbers (other than Memory ) have to be Mungojerrie And Rumpleteazer , a song about two mischievous cat burglars and Growltiger’s Last Stand , an old cat reliving the glory of his youth as a reknowned actor in his finest moments. And like A Chorus Line , Cats is a show where the choreography is the focus. Instead of showstopping song after showstopping song and despite being based on poetry, it’s full of wonderful instrumental music which really lets the audience concentrate on the incredible acrobatics being pulled off by the performers, sometimes while singing! Some of the cast members are literally singing while doing back flips and somersaults without their voice wavering the slightly bit. Truly. Amazing. there was this physical, soundless, heart-stopping instant where the whole audience sat breathless as the full emotional impact of the song came crashing down on us. Absolutely. Incredible. Overall, I had a lot of fun watching Cats . It’s not going into my list of all favourite musicals – the trifecta of Rent , Wicked and The Phantom of the Opera is hard to beat – but I definitely recommend watching it while it’s in town. It’s a great production and makes for a really fun night out! Cats poster by yuriybrisk from Flickr.